The backup server has failed and you have restored it in a new location. You want to restore VM data from backups created by the backup server that has failed. You want to restore VM data from backups created on another backup server. You want to restore VM data from backups on the backup repository that is not added to the backup infrastructure (for example, if you removed it earlier). You want to restore VM data from VeeamZIP files created on your backup server or another backup server. 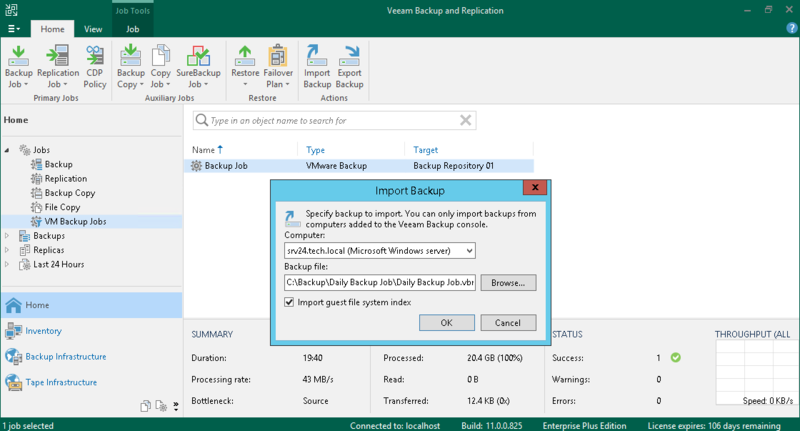 The imported backup becomes available in the Veeam Backup & Replication console. You can use any restore operation to recover VM data from this backup. To be able to restore VM data from previous backup restore points, make sure that you have all required incremental backup files (forward or reverse) in the same folder where the full backup file resides. On the Home tab, click Import Backup. From the Computer list, select the server on which the backup you want to import is stored. Click Browse and select the necessary VBM or VBK file. If you select the VBM file, the import process will be notably faster. It is recommended that you select the VBK file only if the VBM file is not available. By default, index data of the VM guest OS file system is not imported with the backup to speed up the import process. If you want to import index data, select the Import guest file system index check box. Click OK to import the backup. The imported backup will be displayed in the Home view, under the Backups > Imported node in the inventory pane. Backups are imported using the original name of the backup job with the _imported suffix appended.